Having the concrete cleaned at your business place, whether a sidewalk, a drive-thru window or a parking lot not only will enhance the beauty of your business, but also can extend the life of the concrete. At first glance the concrete area may appear to not look so bad, but after following the tips below, I guarantee you will notice a world of difference. The first step to cleaning concrete is recognizing that it is porous by nature. This means that it can hold a lot of dirt and grime. This can make the chore of cleaning it very difficult. Thus, the key to cleaning concrete is selecting a heavy duty cleaner or soap. Why is soap so important? When it comes to cleaning concrete many choose to use a pressure washer. 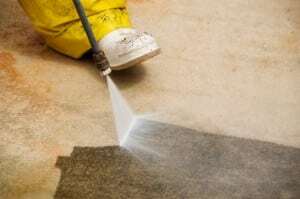 While water alone can do an effective job, in order to remove grease or oil from concrete such as found on parking lots, drive-thru window or dumpster areas, it is likely you will need something a bit stronger. An effective soap can break the bond between dirt and concrete allowing it to be easily removed. A very effective cleaning solution for this type of job would be Metso Green Concrete Cleaner. This concrete cleaning solution is designed for removing grease, oil and other grime that you will likely find on your concrete surfaces. It comes premixed so there is no need to worry about the solution being to strong or too weak. It works both as a cleaner as well as a deodorizer, making the area look like new as it eliminates any harsh smells from the surface. Another effective concrete cleaning solution is Muscle Man Concrete Cleaner. While it is very similar to Metso Green, this cleaner can be used on asphalt, and blacktop as well. Preparation: Before you begin cleaning the concrete, it is always beneficial to prepare for the task at hand. At this time you would want to make sure the desired area is clear of any obstacles including vehicles or other mechanical equipment, all electrical wires or outlets are covered as well as any plants or trees that may be in the direct area. If you will be working in a high traffic area, you may wish to block off the entrances or divert traffic to another location. By preparing well, not only will you save time in the long run, but you will ensure the process produces the best results possible. Apply The Detergent. Both detergents mentioned above can be applied directly to the concrete. The easiest and most effective way this can be done is by using a pressure washer at the lowest setting. Apply the detergent liberally to the affected area. Allow Detergent To Set. As mentioned earlier concrete is porous, so in order to clean and remove the oil or grease, you need to allow the detergent to set or dwell on the concrete. Best results come from allowing the soap to dwell for 5-10 minutes. Rinse. After you have allowed the detergent to set and soak into the pores of the concrete, it's time to rinse. Set your pressure washer on high. First, test rinse a small area to see if the concrete comes clean, if not it may need a bit more time to dwell. For heavily affected spots, pass over the area several times until you see your desired result. Handle With Care. Always wear protective clothing and eyewear when operating a pressure washer. Before you begin, sweep the area and remove any small objects. Loose debris can become airborne under the pressure of a power washer. Never point the pressure washer towards yourself or anyone else as the pressurized water can cause bodily harm. Working With High Pressure. It's important to be cautious when working with high pressure. This is especially true when it comes time to rinsing parking lots because often times they have designated painted-on parking spaces. Paint of any sort can easily be removed by high pressure. Unless your intent is to remove the painted lines, it would wise to cover them beforehand or use extra care when rinsing around them. Proper Nozzle Distance. Proper Nozzle Distance is also important to keep in mind when using a cleaning concrete. The distance is based on how powerful the pressure washer is. For example, with a pressure washer running at less than 2,000 PSI the nozzle shouldn't be more than a foot away from the surface. For a pressure washer running between 2,000-3,000 PSI one to two feet is recommended, while running more than 3,000 PSI should be at least two feet from the area. Flat wheel mounted pressure washer. If you are planning on cleaning a large area, such as a parking lot, garage, or warehouse floor you may want to consider using a flat wheel mounted pressure washer. The task of using a pressure washing wand to this large of an area can be very time consuming. A wheel mounted pressure washer, which is very similar to pushing a lawn mower, is very effective and can save you much time. By following these steps you can make your business stand out from the rest. This entry was posted in Degreasers, General Cleaning, Janitorial and tagged concrete, metso green, muscle man, pressure. Bookmark the permalink.